Full size pattern book 8 1/2" x 11", 121 pages. Patterns created from real, full size saddle patterns - Both Classic English and Sommerset Western or mix and match the pattern pieces! 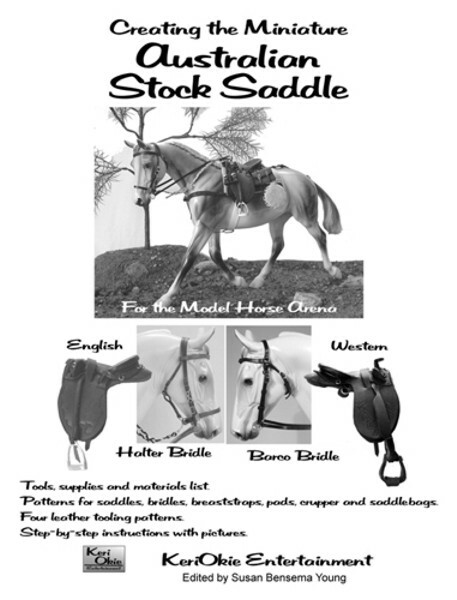 Breyer/Stone Traditional model size saddle pattern, saddletree pattern and assembly instructions. Pattern and instructions for Barco bridle, Halter bridle, two Cruppers, two saddle pads, English girth, Western Cinch, breast plate and breast collar. Reduction ratios for other model sizes (Ponies/Classics/Pebbles). Pictures to assist you every step of the way. Spiral bound to lay flat while you work. Discussion of tools and materials to use for best results. ...bonus pattern and assembly schematic for rear saddlebags!